Inflation Indexed Bonds are a way for people to park their assets in troubled times without having to worry about being eaten up by as sudden outbreak of inflationary pressure. Most bonds offer a flat rate of return and then rely on market pricing structures to compensate for inflationary and deflationary pressures through adjustments in the premium over or below the face value of the bond. The problem with this sort of bond in a highly inflationary time is that the bond might have to sell at a significant discount from its face value if it is a low percentage rate security. An investor who purchased a $10,000 face value bond might have to take hundreds, even thousands, off the price if he were to attempt its sale at a time when inflation was running at a high level. Indexed securities offer investors a way to make sure that they will not take a bath on their bonds if inflation rises suddenly. There are two ways in which bonds can be indexed. • Interest rate adjustable bonds are designed to have the bond pay a higher rate of interest on the principal in the event of rising inflation. Thus, a 5% bond could conceivably become a 6% bond if the bond’s indexing provisions were to come into play. • Principle adjusting bonds are those, which keep the coupon rate the same but add an inflation-adjusted amount of additional principle to the bond, as circumstances require. In this case, a $10,000 bond might become a $10,500 bond but still pay the same original interest rate. Most countries offer some sort of inflation-protected bonds to investors. In certain circumstances, there are both high face value bonds for institutional investors and smaller savings bond-type securities for the little guy. The most common inflation indexed bonds are the US Treasury TIPS and the United Kingdom’s Index-linked Gilt. Both countries also offer small savers the option of purchasing the US Series I Inflation Indexed Savings Bonds and the UK Index Linked Savings Certificates. 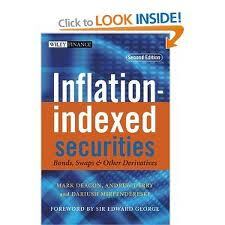 Most inflation indexed bonds are tied to a widespread national inflation index such as the American CPI. Stay up to date on inflation indexed bonds by getting on our FREE eMail list!